I am Gaia, returned to be your guide as you blend your chakras with mine and unite people and planet into Oneness. I invite you now to visit my second chakra. I welcome you into my planetary body just as you welcome me into your human body. The Second Chakra is female/inflow energy. 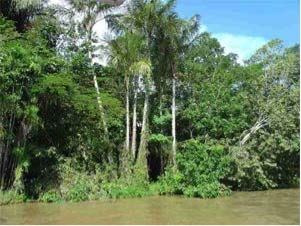 It is the place in your body where you connect to your emotions, and FEEL your “gut instincts.” My second chakra, the Brazilian Amazon, is also where I can best FEEL my body, the planet. Whereas Mt. Sinai is my base, the Brazilian Amazon is my womb. It is the cradle for my life. All of my elements, earth, air, fire and water are abundant here and freely interact with each other. 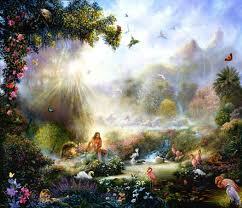 This paradise of undiscovered miracles is sacrificing itself for our transformation. Every day more of my beloved Amazon dies. I mourn Her loss deeply, as should the humans who defile her. But there are no victims here, for all is within the Divine Plan. The Amazon, my womb, is actually pregnant with my Lightbody, who will soon emerge. Through the devastation of her forests, plants and wildlife, she shall rise victorious as the ancient Phoenix Bird, giving rebirth to our new cycle. Mourn not her loss, for my second chakra is love and love ALWAYS survives. The Second Chakra, ruled by your reproductive glands, is a fitting match for my Second Chakra, as the Brazilian Amazon holds myriad secrets of fertility and growth. Your Navel Chakra is where you connected to your Mother via your umbilical cord. This cord was severed at your birth. 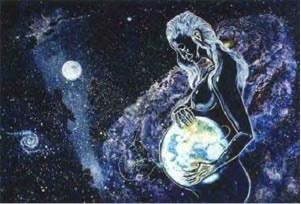 I ask you to connect that cord again, only, this time, it will be connected, not to your “Birth Mother,” but to your “Earth Mother.” Take a moment, to FEEL me, Gaia, as Mother Nature, as you connect your umbilical cord to my womb in the Brazilian Amazon. One of the foundations of your immense creativity is your sensual sensitivity, which registers your emotional reactions to life. If you remain intuitively tuned-in to your Second Chakra, as well as connected to mine, you will reconnect with your personal and planetary instincts, intuitions, and ancient traditions. I ask you to travel again into the core of my body to reconnect our Essences. Down, down, down, you go into the very womb of my planetary body. The further into my core you travel, the further back in your childhood you go. At last you are in my womb, as well as in the womb of your birth mother. As you slowly rise to the surface, you are rising up through your birth canal. At last, you are born again, this time deep in the heart of my Brazilian Amazon. Breathe in the many aromas that hang in the damp air of my jungle. Listen to the sounds of my creatures and see the myriad plants, many of them unknown to your science. Feel my humid heat on your body growing you to maturity. At last, you are again adult, only you are transformed. I am your Mother, and you are a child of Nature. As you walk through the dense jungle and along the many rivers, you feel at ONE with your environment. You listen to the sounds and voices of the jungle’s creatures, FEEL the sense of NOW in which these many life forms live. You hear the rain tapping on the roof of the distant canopy, as you move along the jungle trails. Feel your self alive amongst the “Blossoming Goddess,” as your own creativity is ignited by the fertility of the world around you. Welcome all that you are experiencing into your physical body. Feel the creativity and glory of the Brazilian Amazon within your own navel chakra, as you allow your ancient memory to recollect the many secrets for healing that hide in this vast jungle. Indeed, they are becoming ONE, your body and mine. We are joined now, Root-to-Root and Navel to Navel. Allow the untapped secrets of healing and rebirth hidden within my Amazon to be discovered in your life. I shall soon return to guide you in merging our third chakras.